1. Single-row roller raceway under 45 degrees. 2. Roller diameters 12 to 60 mm. 3. Alternately arranged rolling elements. 4. Constant friction torque with different loads. 5. Higher dynamic service life than similar Ball Slewing Ring designs. 6. 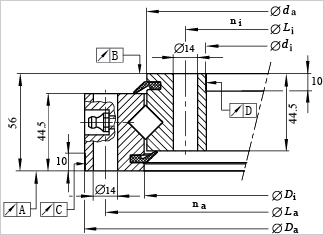 Higher demands on the rigidity and precision of the mounting structure in comparison with Ball Slewing Rings. 7. Applications: Robots, antennas, medical technology, positioning devices, machine tools. 8. Can be supplied to special customers' requirements.